One goofy 30 lumens LED Energizer headlight and a cold silver metallic pocket flashlight later, I arrived in school on March 11th with everything sealed in transparent zip lock bags – one pocket carrying a digital camera and the other, two strips of Handsplast and two sachets of alcohol swabs slid in between crisp banknotes. I took my seat in the courtyard, fidgeting with the buttons (for the 10,563th time) on the LED headlight to ensure that they worked perfectly as Mr. Raja went through roll call and distribution of paper bags upon paper bags of baked sausage Danish with an apple each to the various Year 11 classes. My fellow peers were also showing off their collection of light-emitting-sticks, from the smallest being the plastic Eveready bulb torch to the large, bulky, 6V battery-mammoth of a torch. 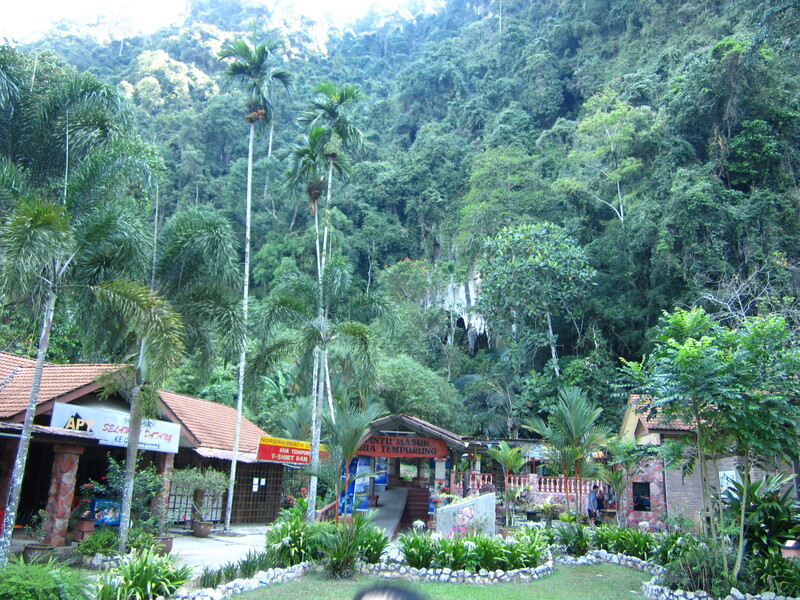 This is what the cave looks like from outside. You can’t really see the cave entrance though. 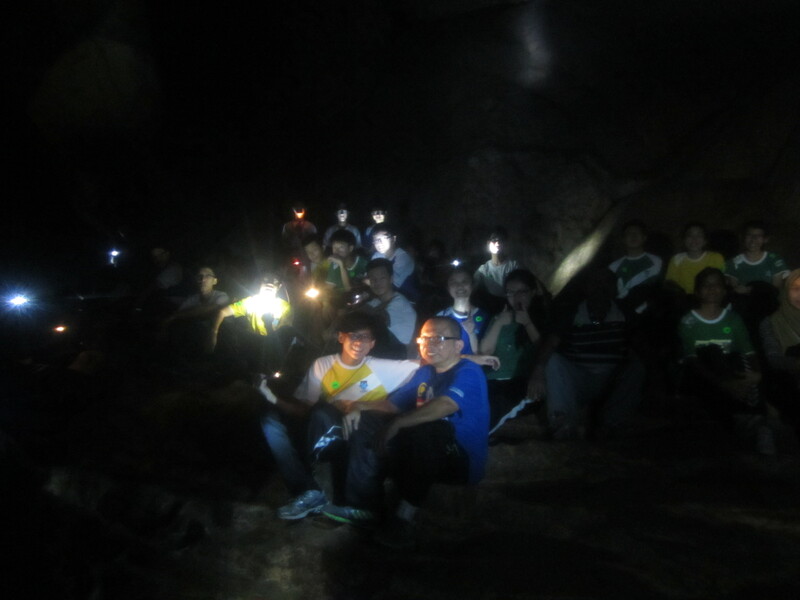 After a long two hour forty-five minute drive to Gua Tempurung, Perak, we were briefed by our guide on what to expect in the cave as well as the relevant safety precautions. He reminded us to have at least one torch for every two persons. I smirked at that remark, knowing that I had gotten the ratio completely the other way round. 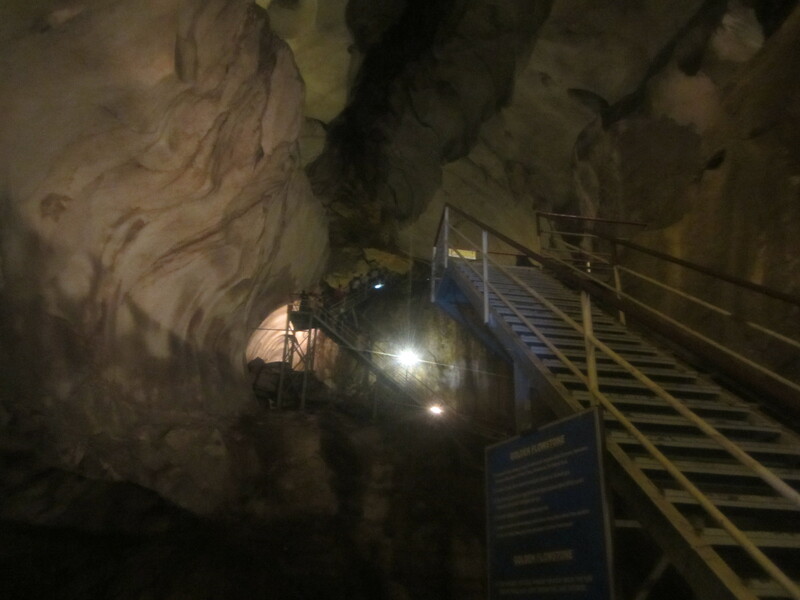 We entered the cave; the first five platforms were lighted and involved a tiring climb up many flights of stairs, some made of metal while others were of stone. 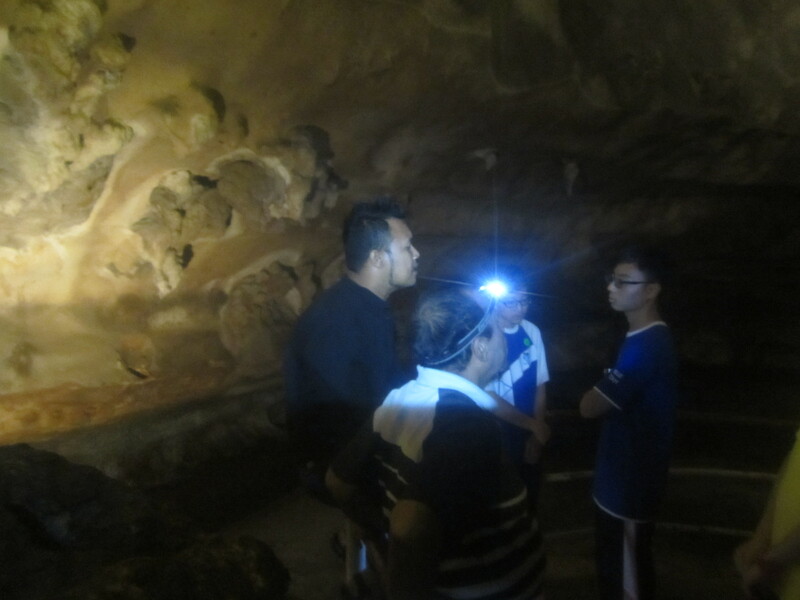 Our guide pointed out and explained the various rock formations in the cave – the stalagmites and stalactites, the former growing upwards from the ground and the latter growing downwards from the cave ceiling, both eventually joining to form a cave column or tongkat gua. “Two hundred years every one inch” the guide kept repeating, referring to how long these structures took to form in this 200 million years old limestone cave. Our friendly guide explaining some stuff. In addition to that explanation, he pointed out interesting looking formations of rock that seemed to resemble everyday objects and animals, such as a flying t-shirt, a seahorse, a woman with long hair (which was incredibly creepy), a pair of hands, a leopard perched on a tree as well as an eyeball. Amidst all the commotion and excited chatter, his powerful torchlight beamed across the chamber to point out a rock formation on a ledge quite high above that resembled a tombstone. As I did not quite catch his remark before he beamed his torch, I was unsure of whether he was referring to a real tombstone or a rock formation that resembled a tombstone and both ways, this was a very chilling fact indeed. One of the many flights of stairs we had to climb. We were also shown carvings of Chinese characters made by members of the Malayan Communist Party championing the Red Army Revolution when Gua Tempurung served as one of their main hideouts during the Malayan Emergency. When we completed all the first five platforms, the numerous flights of steep stairs all done and passed, our guide led us out of the paved path. This meant crawling under the metal railing onto the uneven rock, abandoning that rusty frontline of metal which had previously been the only thing preventing us from plunging off a ledge. Short photo session while waiting to slide down the slope of no return! Our next daunting task was to slide down a steep 45 degree incline of rock with nothing but the velvety fabric of one’s sports day track bottoms protecting one’s glueteus maximus. How was one supposed to hold a big cylindrical flashlight while sliding down? The answer came from one of the guides who promptly remarked with a grin, “Just slip it into pants using your waistband to hold it in place”. Off I went, sliding precariously down the slope, trying to decelerate my descent by gripping onto whatever I could, shaking tremendously in the process. “To the left, to the left!” the guide would keep shouting at you. At that moment, you realise that if you were to slide towards the right, well, that’s the end of sliding for you, as well as your life. After making it downhill, as well as inspecting my posterior for any shortcomings of fabric, we made our way down steeper rocks until we reached a small stream. This was the start of the segment that I’d like to call, “Level of Rocks in Your Shoes : Over 9000”. We did a bit of crouching and crawling with stalactites protruding overhead and then there was wading through water which was (thankfully) at its deepest, only knee-high. Of course, as one waded through the water wearing only canvas school shoes, small stones find their way into one’s shoe, posing much annoyance along the journey. After much walking, we finally reached a beautiful opening into the forest. The feeling of warm sunlight kissing one’s face was incredible after spending the past 2 hours depending on the work of electrons flowing through the circuitry of a light emitting diode as a source of light. Students took a moment to play in the small stream that gushed past and its cool, pristine water was a source of enjoyment for the many that sat down to clean their shoes and indulge in a water fight with fellow peers and teachers. 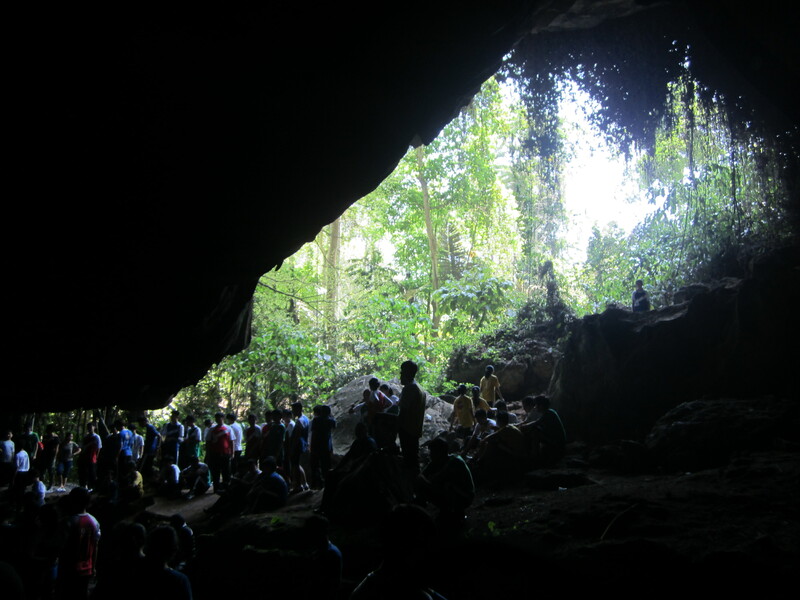 The opening of the cave which we thought was the closing of our journey. 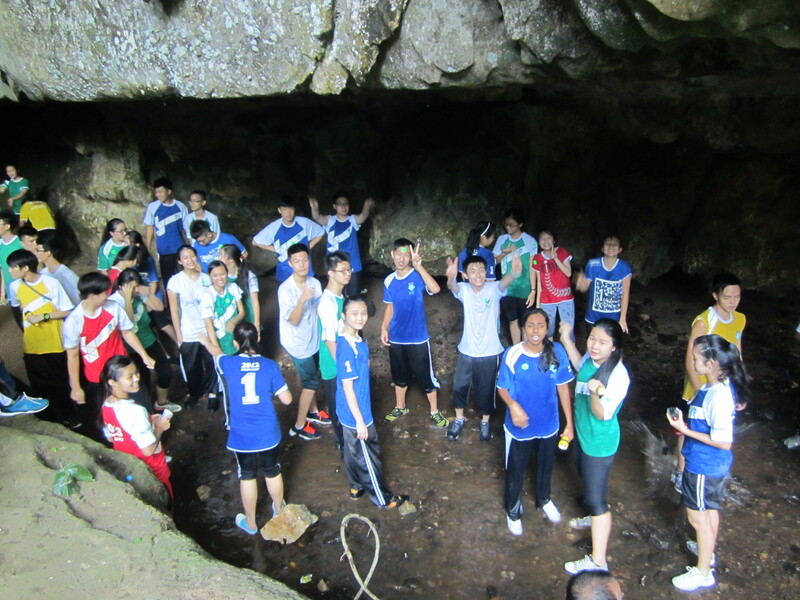 That opening which we all had thought to be the end of our caving adventure turned out to be just a pit-stop before the long journey back. This brought up the spirits of those who felt that they haven’t got the full kick yet. Our journey back seemed to be just the way we came but where’s the fun in that? Precisely. Our guide made us crawl through water under a giant rock, through an opening which was probably about three feet high only. Aha! This was when my zip-locked flashlight became an underwater flashlight and so I could crawl through with plenty of light guiding the way. I felt rather sorry for the poor guys who brought along waterproof bags which were useful until you find yourself on your knees with a giant canvas bag bobbing up and down in front of your head. Not the best crawling partner, I must say. The best part about these tight passages were that they were just next to the paths we had walked on when we first entered the cave but did not notice. It was truly marvellous what beauties nature hides in the dark. Even as one passes the crevices, one can’t help but notice the beautiful smooth texture of marble in its natural state and so reaches out one’s hand to get a feel of it. In fact, as we were exiting the cave (which turned out to be the stream below the cave entrance’s catwalk), many stopped to sit down on the smooth white marble surface, the stream flowing through the miniature valleys on the rock, carved by the water itself. Enjoying the cool breeze, I removed my dirty shoes and dipped them in the shallow, clear and cold water, to clear the rocks out of them. This was truly the pot of gold at the end of the rainbow; a day of adventure well spent with great company. I would definitely look forward to more spelunking adventures in the future!